See how Alzheimer's affects the brain. 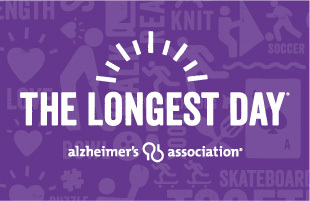 Held annually on the summer solstice in the northern hemisphere, The Longest Day brings teams around the globe together to advance the efforts of the Alzheimer's Association, the world's leading voluntary health organization in Alzheimer's care, support and research. The Longest Day offers complete flexibility to international teams. Participate from any country in the world or join teammates across several countries, use our tools to reach your fundraising goal, and receive the same reliable support from The Longest Day coaching staff. This is your day to honor those facing Alzheimer's and show those affected by the disease they are not alone. From sunrise in California to sunset in Italy, members of Sigma Kappa's European Alumnae Chapter got active for the cause by cycling, swimming, running and gardening. Employees at Solberg Manufacturing in the UK planted a garden as a tribute to the company's founder, who passed away after a long battle with Alzheimer's. Solberg also had teams in the United States and Belgium. Mike Zigomanis hiked in Rio de Janeiro, Brazil, but the rest of his team ran, golfed and did Pilates from locations throughout the United States and Canada. Formed in 1980, the Alzheimer's Association is the world's leading voluntary health organization in Alzheimer's care, support and research.